Artichoke Facts, an information sheet for kids cooking activities. Artichoke facts and general information about artichokes. 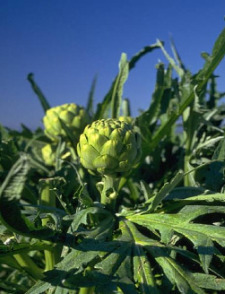 Artichokes are the flower bud of a thistle plant, see the picture below. Choose tightly closed buds that are green or purplish-green in color. Store artichokes in the refrigerator. Cut the sharp end tips off with a serrated knife. You can scoop out the middle fuzz before or after cooking. To cook, boil artichokes in large pot of water until a skewer pierces through the middle easily. Time may vary according to size but could be 20-40 minutes. To eat, dip leaves in butter or oil dressing and bite off fleshy end. When you get to the center and all the leaves are off, scoop away fuzz, being careful not to take the heart out with it. Eat heart or prepare it in an artichoke recipe. 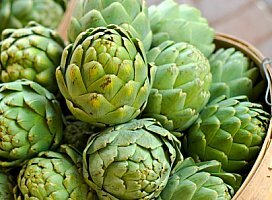 Artichokes contain fiber, magnesium, vitamin C and potassium. They also have a high amount of antioxidants. Allow cream cheese to come to room temperature. Cream together mayo, cheeses, garlic, and basil. Mix well. Add artichoke hearts and spinach. 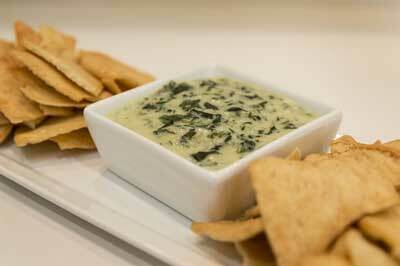 (Squeeze all excess water out of spinach before combining) Mix until well blended. Spray pie pan with Pam and pour in dip. Bake at 350 for 25 minutes. You can also top with ¼ Cup mozzarella cheese, grated.